Robert H Smith school of Business, University of Maryland played host to a ground-breaking event. Dr. Hemendra Mittal from Arogya Foundation of India met with teams from CTIS (Capital Information Technology Services) and Handheld for Health, as well as distinguished faculty members from the school's Center for Health Information and Decisions Systems (CHIDS). The session started with presentations by Dr. Ritu Agarwal, chairperson CDIH, Dr. Shashank Garg from Handheld for Health, CTIS Vice-President Shri Anil Srivastava and Dr. Mittal himself. This was followed by discussions and brain-storming sessions on how CTIS and Handheld for Health can aid Arogya through use of Information Technology, as well as how CDIH can get involved in performing a scientific assessment of impact of Arogya on village health. Dr. Raj Shah, CEO CTIS took great personal interest in Arogya Yojana and expressed the desire to sponsor Arogya for three thousand villages on a personal basis. 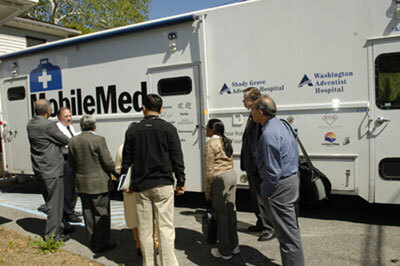 A visit to Rockville was arranged where the work of CTIS in community health care through use of Mobile Med was experienced first-hand. The discussions, presentations and brain-storming sessions over 5 days provided a tremendous fillip to the Arogya Foundation program in the United States, along with an action plan for improving health of our tribal brethren. As part of action plan around 90 villages will be covered through IT devices provided by Handheld for Health using CTIH resources, and a comparative study of these with a set of villages not covered by the IT devices will be done by CDIH. Concluding day discussions where Smt Shashi Srivastava and Shri Ramesh Shah also participated saw the proposal to setup Arogya Foundation of USA being mooted as all participants were very impressed by Arogya Yojana's charter and impact on improving health care in remote tribal villages. During his trip to the USA, Dr. Mittal attended the Annual Conference of American Association of Physicians of Indian origin (AAPI) in Philadelphia. 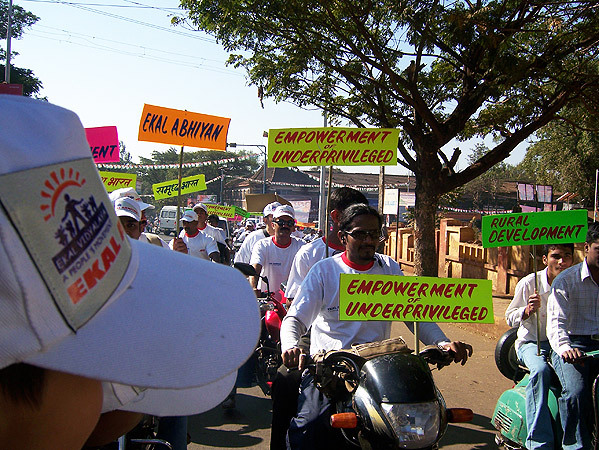 He actively participated in the Ekal Movement stall there and introduced the Movement to many visitors. The stall attracted many regular supporters of Ekal who reiterated their support for the Movement, as well as many new persons who were impressed by the concepts of the Movement and pledged their support for this noble cause. United States Office of Personnel Management Washington DC -Office of Combined Federal Campaign (CFC) operations has found Ekal Vidyalaya foundation of USA to be eligible for inclusion on the National Part of 2007 Combined Federal Campaign (CFC) Charity list. The CFC code that donors will use to designate their contribution to Ekal Vidyalaya Foundation of USA is 12279. The approval was the result of the immense preparation and efforts put in by Dr. Rajiv Kumar of Ekal DC Chapter and Mr. Narendra Ved from Houston office in completing the application process. Click here to view approval letter. 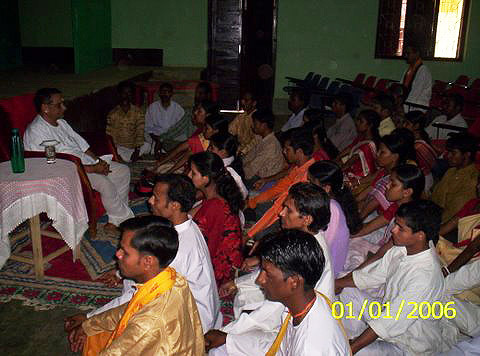 Since the inception of the Ekal Movement, the Kendriya Sanchalan Toli (consisting of whole-timers) meets for a "Chintan Varg" once every four years. This event is aimed at assessing, evaluating the current field working and defining improvements, changes to re-orient the field working with the goals. 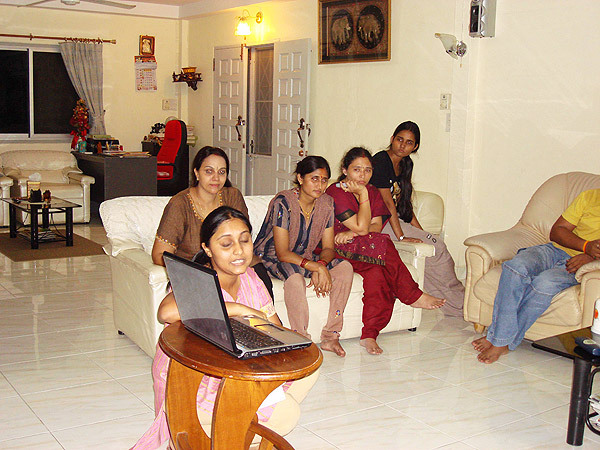 It provides a fresh impetus to the working and rejuvenates the field working. This year's Chintan Varg (the last one was held in Bangalore in the year 2003) was held in sacred city of Onkareshwar in Madhya Bharat, from 1st – 5th May. Around thirty members spent five days in intense brain-storming and analysis sessions. The sessions were enriched by the presence of two senior most members of the Ekal Movement - Shri ML Jain (National Secy. 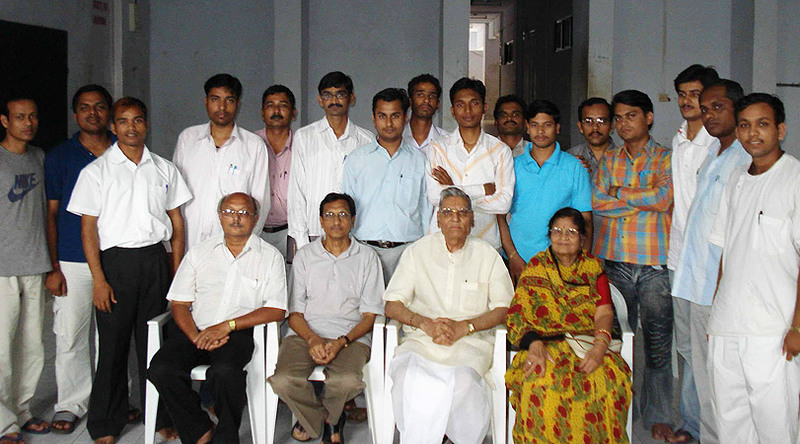 FTS) and Shri PL Chaturvedi (ex-VC Ajmer University). The entire proceeding took place under the guidance of Ma. Shyamjee Gupta. The Chapter Prakalp Pramukh Varg is a workshop held to train the karyakartas of various chapters in office working and help promote a common working ethos with respect to areas like allotments, disbursements, donor feedback etc. 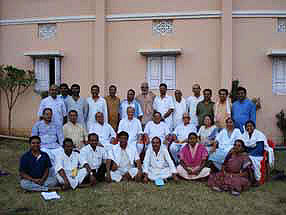 This year’s CPP Varg was held at Keshav Srishti in Bhyander, Mumbai from 7th to 9th May, 2007. Karyakartas from ten chapters participated - FTS Delhi, BLSP Delhi, EVFI Delhi, AFI Delhi, FTS Surat, FTS Bhopal, FTS Mumbai, FTS Bangalore, BLSP Varnasi and FTS Ernakulam. In addition Karyakartas of Yuva Vibhag - Samanvaya Karyakartas also participated. 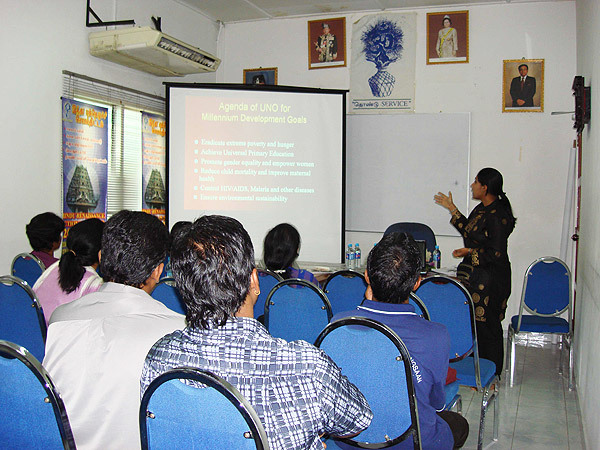 A workshop to discuss the details of running the newly formed State Voluntary Organization (SVO) named "Om Sewa Bharati - Madhya Bharat" was held in Bhopal on 13th May, 2007. Around twenty-two people comprising office bearers of the organization, Anchal Samanvay Samity members and Kshetra level karyakartas participated in the workshop. The National Core Group NCG (comprising of senior members of the partner organizations of Ekal Movement) meeting was held in Delhi on 20th May in hotel Le Meridian. The members were warmly welcomed by the karyakartas of the host organization - Bharat Lok Shiksha Parishad (BLSP) and the enthusiasm and energy of the karyakartas made for a most constructive and fruitful meet. The meeting was conducted impeccably by Shri Naresh Jain, convener NCG who ensured a positive flow of the various sessions and made sure the agenda and timings were followed precisely. 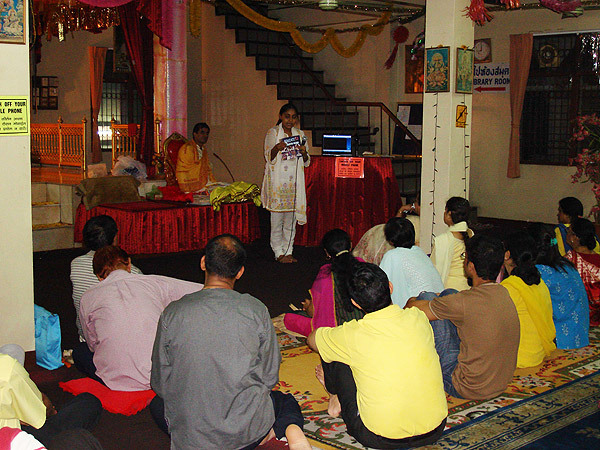 It started at 10 am sharp with Omkar and concluded at 6 pm with Shanti Mantra. The discussions were very focused and interactive leading to specific decisions and policy conclusion agreements. Changes in "Training Department Working" and "Decentralization of Management monitoring systems" were mooted, discussed and agreed on. Inputs from the Chintan Varg were discussed and action plans for the same agreed on - in areas of "Expansion and Quality consolidation", "Focus on support activities" and "Ekal System Implementation" to name a few. The meeting was followed by an evening of cultural entertainment "Abhinandan" organized by BLSP with a most enjoyable Kavi Sammelan. The high point of the evening was Ma. Shyamjee's soul-stirring speech in which he gave a clarion call to all to fulfill their parts in translating the vision of a "Samarth Bharat" into reality. Chalo Gaon ki Oar, Hamein fir desh jagana Hai!" Since 2005-06, Ma. Shyamjee has embarked on his march towards Ekal villages, thereby setting an unprecedented example in the history of the Ekal Movement where the top most karyakarta meets with the grass-root level karyakartas who form the building blocks of the entire Ekal Movement - the Acharyas, the Arogya Sevikas, the whole-timers. Ma. Shyamji made it very clear when he started the tour that he would stay only in the houses of whole-timers or Jeevan Daanveer karyakartas as it is, and no special arrangements were to be made for him at all. During last year, he covered 120 Anchals. This year he will be visiting Sankul centers. In the first leg of his Sankul Prawas, he has covered Assam, Himachal and Delhi regions, visiting 41 Sankul kendras (90 schools). The attendance for his meetings has been remarkably high (from 90-100%) in spite of stray events in sensitive areas of Assam with whole-timers and village samiti members turning up for these interactive sessions. The tour has witnessed tremendously moving events when, amidst these remote, economically deprived villages, emerge the gems of Bharat's youth -- young men and women who have taken a vow to dedicate four years of their lives to the service of Bharat Mata. It was most touching to witness the spirit of the Mothers and Grandmothers of these invaluable youths who told Ma. Shyamjee " we are proud of our sons/daughters because they will be serving Bharat Mata and saving our traditions of Sanatan Dharma which is the true Manav Dharma. We do not care even if we have to go without food for some days because the only earning member of our family is dedicating these years to Bharat Mata". Such brave words are the hallmark of Bharat's courageous Mothers. So far fifty-one youth have performed "Jeevan Daan". To quote Ma. Shyamjee "The hidden treasure lies in the lap of Mother Nature. Love them. Trust them. Give them the opportunity. They will return 200% of what they get - they will give you a NEW BHARAT!" Shri Ravi and Smt Sarita Mansingka lost their young son Siddhartha at the tender age of 11 in a tragic accident in 1992. Sarita's brother, Shri Ashok Modi (founder member FTS Kolkata) advised his sister to devote some time towards the cause of tribal children which would help heal her wounds. Shri Ravi and Smt Sarita found solace in keeping the memory of their son alive by dedicating themselves for the literacy endeavor among tribal children. As part of their endeavors, to commemorate Siddhartha's birth anniversary, a grand program is organized in Jharkhand where the best teachers, whole-timers and students are honored with prizes in cash. The winners are chosen on the basis of highly competitive state-wide competition with the best winning the top awards given to them in a beautiful ceremony. This is the Siddhartha Puruskar ceremony, where Sidhartha lives on in the gravity, intelligence and humor of his fellow tribal students. Shri Dinesh Modh is a microbiologist working with Pfizer in New York, USA. 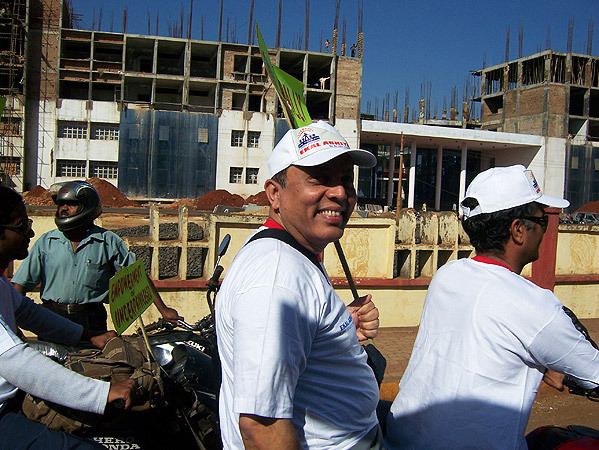 He is associated with Ekal Foundation of USA and during a visit to India, wanted to visit Ekal Vidyalaya. 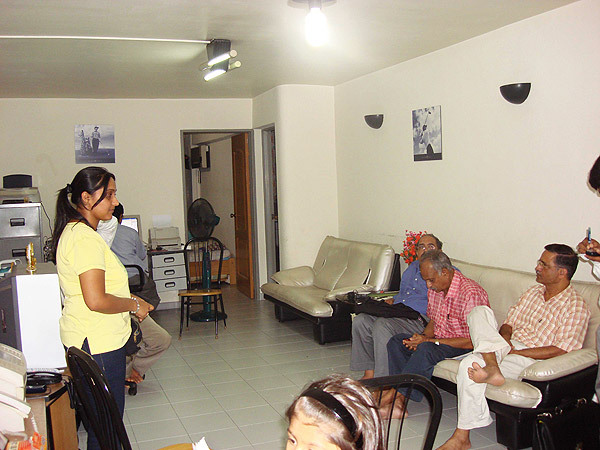 Hence, a Vanyatra to Cuddalore was organized by Dr. Satheesh on 14th April, Tamil New Year Day. The group of four people (Shri Dinesh Modh, Dr. Satheesh, Shri TV Seshadri and Shri N Madhavan) met the members of the kshetriya samiti lead by Shri Ganapathyji (kshetriya samiti pramukh) for a very constructive discussion about the functioning of Ekal Vidyalayas in Cuddalore anchal and areas of improvements in the schools as well as villages. This was followed by a visit to the village of Thattampalayam where the Ekal Vidyalaya was celebrating its Second Annual Day. The students treated the guests to a beautiful program of songs, dances and skits. In one of the skits, the importance of education and effects of lack of it were presented which was very well received by the audience consisting of their parents and neighbors. 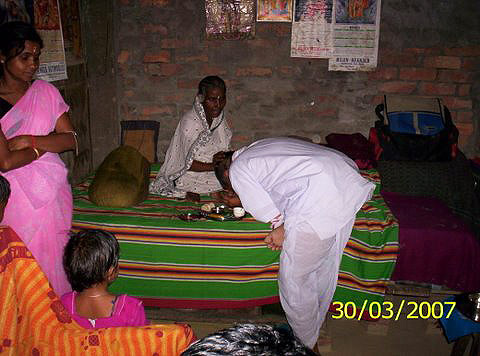 During the interaction which followed, the students told the visitors how earlier even for accidents like a fall from a tree they had to travel 10 km for first aid, whereas now treatment for such accidents and injuries and basic problems like stomach ache, fever is available within the village itself. The villagers also shared their happiness at the improvements the Ekal Vidyalaya and Arogya programs had brought about in their village. Shri Dinesh Modh was greatly affected by the change in attitude of the children and said they would definitely change their parents and make the village a truly wonderful place to live in. He gifted them sweets, whistles apart from sets of pencils, crayons and sketch pens. He also appreciated the Acharyas and the immeasurable dedication and enthusiasm of the karyakartas. These words of praise from a visitor from a "far off land" touched the children, villagers and karyakartas and renewed their dedication to improving their village. Ekal Movement's first ever Youth Ambassador, Ms. Meenakshi Lal (aged twenty-three) undertook a successful fifteen day tour of the South-Eastern region of Asia visiting the countries of Thailand, Malaysia, Singapore and Sri Lanka. She was warmly welcomed everywhere and the concepts of Ekal Movement were very positively received. At certain places keen interest was shown in starting the Movement locally to aid in progress and empowerment of local communities. Many people wanted to know more about the Movement, to visit India to participate in Ekal Global Learning program and how they could support the Ekal Movement. It was a truly wonderful tour where Ekal's first Youth Ambassador, with her zest, enthusiasm and dedication successfully "spread the Ekal message among new countries and reached out to our brethren residing in different lands". The annual meeting of the Washington DC chapter of Ekal Foundation is scheduled for 3rd June. 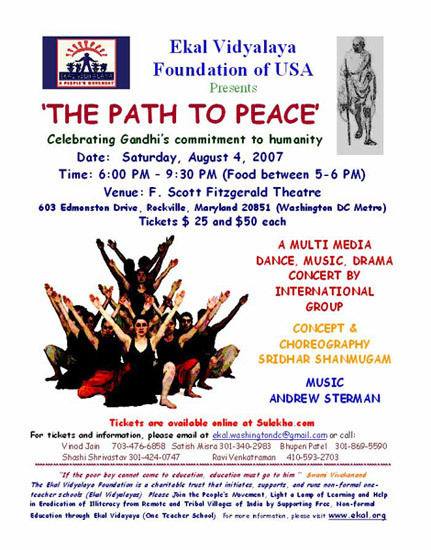 Please contact ekal.washingtondc@gmail.com for further details. The next Chapter Orientation Course is scheduled for the 17th of June, in Raipur. COC’s are one day intensive workshops which serve to mobilize, review and improve the working of chapters. These are organized in all chapters on a rotational basis. Central team members with expertise in Ekal Systems are an important and integral part of these workshops and entrusted with the responsibility of making them a success. 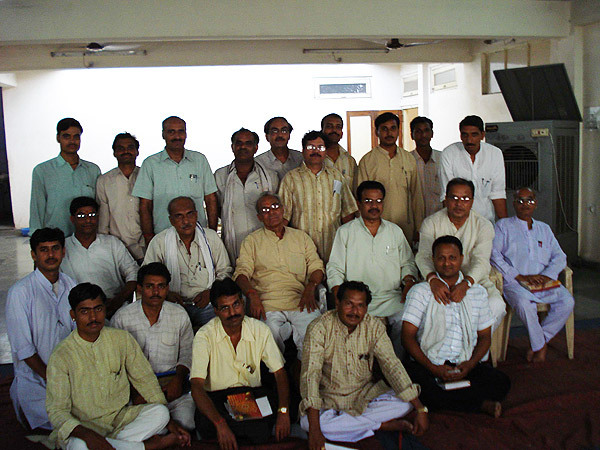 The Jaipur Chapter of Friends of Tribal Society will be inaugurated on 10th June, 2007.